Ok, I’ll say it. I hate punting! Yes, I hate punting because we did not score or make a first down, but it scares me to death to send the punt team out. It’s probably my fault as a coach for not spending more time with the punt team. Not probably, it is my fault, and the cause for my own angst. We’ve been very lucky the last two seasons punting. Last season as a 4th grade pee wee team, I think we punted the football maybe 5 times the entire season. Mainly because we are a good running team and never got ourselves in trouble, but I know the percentages are going to catch up to us this season. Plus, I will only punt if we are backed up inside our 25 on a 60 yard field. So, my goal this season is to perfect our punting game. I want to focus this post on the punt and long snap, because in my opinion, these are the two most critical areas in punting besides punt coverage for youth football teams. In Jr High, my 8th and 9th grade coach was a long snapper in college and just missed getting picked up by the Houston Oilers as a long snapper. I was the Center and Long snapper in 8th grade. On the long snap, Coach O’Neal taught us to pass the ball through our legs like a QB throws a pass. He had us grip the ball like a pass then set the ball on the ground with the laces on the ground with your opposite hand on top of the ball. Our stance was a little wider than normal, and we would look through our legs at the punter. He also had us extend the ball forward just enough so it wasn’t uncomfortable. You had to practice quite a bit to get the stance, grip, and ball extension just right. On the actual long snap of the football, he had us pull the ball through our legs, keeping the ball low on the ground, and once our elbows were close to our thighs we started rotation and passed the ball through our legs to the Punter. He said once you got good, you could use your thighs to help catapult the arms through the legs to get more power on the snap. For some real long snap instruction visit LongSnapper.com and see pictures and watch videos by the Chicago Bears long snapper or visit LongSnap.com another NFL long snapping instruction site. Or below you can watch the Philadelphia Eagles Long Snapper, Jon Dorenbos’ instructional video on long snapping. Pee Wee Football Punters are not very accurate. It’s really a gamble to send a pee wee punter on the field unless you get very lucky and get a natural punter. I did some back-up punting in High School but never saw any game time, thank god. I was nervous at 16 / 17 so I can imagine what it must be like for a 9 / 10 year old punter have 10 players running at him while he is trying to receive the snap and then punt. Plus, all the pressure is on you to make a good punt and in most cases not a very good game situation backed up on your 10 yard line. Not an easy task for a 10 year old. So, go easy on your 10 year old punter. I think Punting is an art not a science. But since we must start somewhere, let’s start with the science. Special Teams is a game breaker in youth football. 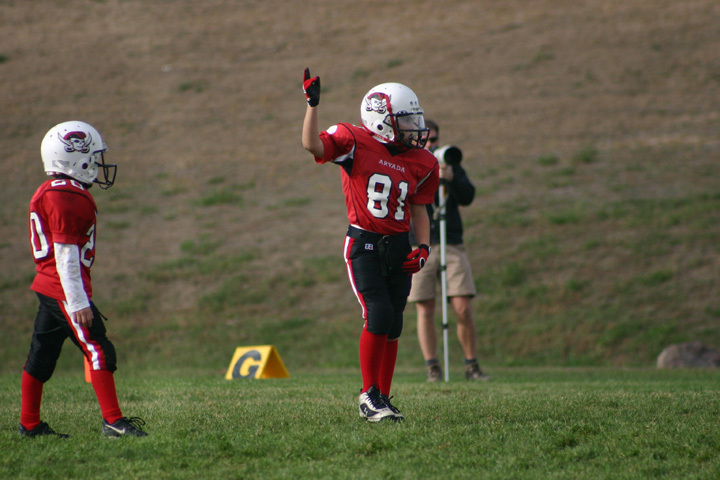 Most pee wee teams do not practice Special Teams the needed amount of time, and they pay the consequences in the game. Plus, a lot of youth teams, place a high number of minimum play players (MPPs) on their Special Team units. Not enough practice time and MPPs usually leads to disaster. Our pee wee team has a dedicated Special Teams Coach, and we spend at least 45 minutes a week out of 6 hours of practice on coordinated Special Teams practice. This year, I am turning our warm-ups and end-of-practice conditioning time into Special Team drills to get 30 minutes more of Special Teams practice a week. We also ask our skills players, kickers, punters and returners, to practice at home. I wish we had more time, because this is still not enough. We have been very lucky with our Special Teams play, but I still cringe when we punt the ball. I think the punt is the most dangerous play in youth football. We only punt if we are backed up within our 25 on a 60 yard field. There are so many variables in the punt starting with the snap. You must find an accurate long snapper and practice the long snap everyday. A bad snap can add 7+ more yards of negative field postion to an already difficult defensive situation. Punters are also very inconsistent at the pee wee level. The receiving of the snap is tough and then to punt with 7+ players running at you takes a unique personality to stay calm and not miss the snap or shank the punt. We ask the punters to kick out of bounds toward our special teams’ coach. I do not want the possibility of a return, because the punt return in youth football is a great play for the return team, especially if the team has a top running back. Open field tackling at the youth level is very poor and a good punt returner on the loose is a chance for a big gainer or even a TD. So never kick down the middle of the field to the punt returner. I am also worried about Kick-offs, especially, if we have not called an on-side kick. Like the punt, a good returner can mess up your day. I never kick deep. I usally kick to the second line of receivers and try to kick to an MPP. We kick the ball on the ground so there is a possibility of a weird bounce and fumble by the receiving team. Never kick to a starting running back that is also on the kick return team. Pick out the player that is having trouble where to line-up or is not paying attention. John T Reed says in his book, Coaching Youth Football, to kick to your sidelines, because it is hard for the players across the field to hear their coaches and usually have uneven spacing allowing for a great on-side kick opportunity. Kicking short also reduces your chances for a big return. Most of the time, the receiving team falls on our squib kicks. You must train your kickers to identify these keys and be consistent. If your kicker can not kick to the second line on the ground and kicks high and deep, you must find another kicker. We have been very successful with our kick-returns. We have four talented returners, all starting running backs. We spread these returners around the kick return unit based on the opposing kickers kicking habits. We put one of our starting FBs on the front line because he looks like a lineman, one of our halfbacks on the second line, another FB offset behind the 2nd line and our speed demon deep offset from the deep FB. We then move them around these lines based on the kicker. We score a TD on a return about every other game. The kick return blockers have assigned players to block. We have tried to set wedges and walls but this has not been as successful as assigned blocks. Our punt return unit is a punt block unit. We assign a punt returner and ask him to return the punt if he is unopposed. We stack the line adnd try for a blocked punt. We tell everyone on the team, except for the returner, not to touch the punt once it has crossed the line of scrimmage. A big advantage to any youth football team is a PAT kicker. We found our PAT kicker last year and he was very successful, about 40%. Because the PAT Kick is 2 points in our league this is a huge advantage. My advice to any youth team is to start working on this skill early. We waited one year too late. Like the punt, practice the long snap and make sure you have a hands player holding. Our holder is our speed demon back because he can pass and runs well in a crowd if the snap is muffed. Practice, Practice, Practice Special Teams! Good luck.